Police are appealing for information following the accident. Police have issued an appeal for information after a van driver collided with a wall in Barnoldswick in the early hours of this morning. 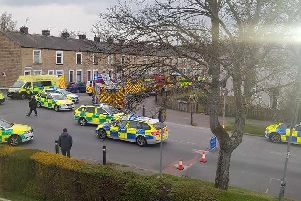 The driver suffered serious injuries after he lost control of the Ford Transit van he was driving as it crossed a hump back bridge in Salterforth Lane at around 2am. The van hit a stone wall and came to rest on the opposite side of the road. The driver, a man in his 20s, suffered head injuries and was taken to the Royal Preston Hospital. He remains in a poorly, but not life threatening condition. Anyone with information is asked to call 101 quoting log 0176 of April 15th.